There is a subgenre of sci-fi that the masses are unaccustomed to, one that includes in its ranks Moon, Primer and 2001: A Space Odyssey; one that contemplates and meditates in the ideas that exists within. Last year, we found perfect execution of this in Under the Skin, and this year, it’s Ex Machina. Alex Garland (screenplay for Sunshine and Dredd) in his directorial debut has crafted a pensive, tense film that makes all the right turns and is centered on a myth since the days of Frankenstein: to create Artificial Intelligence. 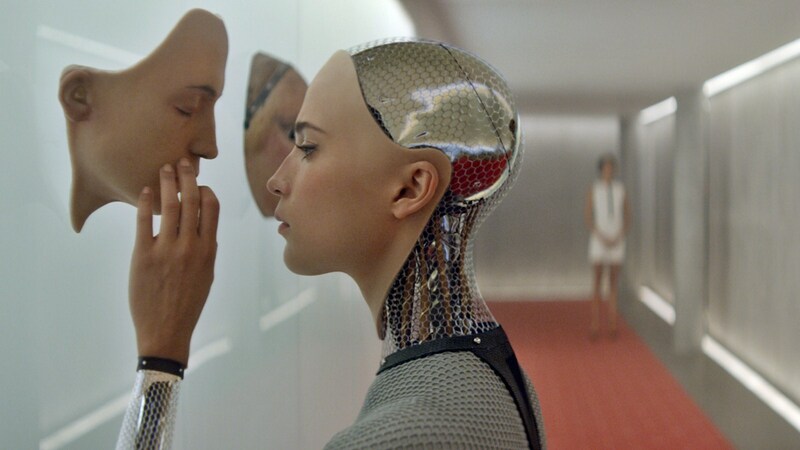 Instead of resorting to a clichéd AI plot, Ex Machina is incredibly clever and manipulative of its audience through its questions on the extent of consciousness. This is a most engaging science fiction fare that manages to captivate with excellent performances, minimalistic imagery and displays a level of intelligence that is absolute pleasure, making it the best of the year so far. From the very opening frame, we notice a distinct bleakness and silence that alludes to there being something not quite right. The audience is given eyes through Caleb (Domhnall Gleeson), your everyday coder who wins the office jackpot to visit the company owner Nathan’s estate. Nathan (Oscar Isaac) is a tech genius who built the ‘Blue Book’ – a Google-like universal search engine – at the age of thirteen and now heads a company that mints millions through data. But that’s not all he does in his fortress of solitude, for within those walls is the real reason Caleb is called in: an android named ‘Ava’ (Alicia Wikander) which is by far the farthest stride ever made toward artificial intelligence. What the charismatic yet awry Nathan wants from Caleb is to be the human half in a Turing Test that he wishes to conduct to analyse whether Ava is in fact, pure artificial intelligence. To reach this conclusion, Ava is required to be tested for non-induced consciousness, reading off the partner, and even sexuality toward a possible mate. The movie proceeds in a series of ‘sessions’ that present themselves like chapters in a book and which carry all the weight of one. In fact, Ex Machina tastes more like a science fiction novel than anything else; with very little action involved, the intense conversation is what sets this film apart. It is no surprise here either, as the director Alex Garland is primarily a screenwriter. There is something that unknowingly works about a film that is directed and written by the same person, and this shows in every scene with the lines perfectly tuned to heighten the right emotion in sly accompaniment with visual ideas. It is an extremely cerebral exercise we partake in; and unlike many others it doesn’t feel preachy or like class, instead every word explains just the right amount needed to process the experiment that the three are partaking in. If you liked how in Interstellar Romilly explains wormhole travel with a folded paper, then this one is right up your alley with its elegant use of simpler objects to explain more complex science. The perfect example for this would be Nathan using the Jackson Pollock painting to help Caleb realize the need for absence of planned awareness to complete pure consciousness. There is just something about these smaller moments that make us feel infinitely smarter to adapt to the plot, at the same time imparting a poignancy that is lost in lengthy exposition. It is not an overstatement to say that the conversations are simply the best part of the film, and this owes itself to numerous reasons. One, as I have already mentioned, is the simple yet contemplative script that suits every conversation perfectly; a gift of having one person handle the creative process. Weaving together excerpts of history, mythology, computing science and literature, the characters seem very aware of the world they live in and exactly what Ava would mean to that world. The second, and in no sense lesser is the elevated tension created by the performances that drive the conversations. Oscar Isaac is here flaunting his best work yet, easily taking the form of the unhinged and secretive Nathan, who is the most intriguing character as he goes about his day pumping iron, drinking to his genius and carefully manipulating Caleb. Domhnall Gleeson and Alicia Wikander too provide outstanding character acts to this tense and meditative piece of science fiction, the former providing us a protagonist who is easy to follow while having an entire character to him that affects the turn of events over the course of the film. Wikander’s Ava is no less excellent; in fact in any other film she would be the highlight of the show, methodically creating an android that is mechanical in its ‘micro-expressions’ while maintaining a fluidity that makes us falter in our steps. The cerebral gameplay between the characters is executed almost too well, that at every point we are left guessing the true intentions of each character, questioning which is real and which manipulation. These are not characters that inhabit titles of geniuses but stoop to relatable levels for the audiences’ ease, rather we are able to see their minds at work as they unfold trickery and deceit, as well as patterns that go at first unnoticed. Admittedly, at earlier points in the film, I did get the feeling that these obvious geniuses were missing some very obvious peculiarities, only to find them answered as the film progressed. No stone is left unturned, as through two sets of conversations the film which started off as purely scientific enters a realm of high tension and precise manipulation. The first of the two are those of the Turing Test between Caleb and Ava which are seemingly distressing, that of a man falling in love with a princess locked away in a castle in the mountains. The second, and more relatable one at first glance, is between Nathan and Caleb which starts off way too easily and as it proceeds, becomes subtly more daunting and controlled by the tech genius. It is in these conversations that the most philosophical parts of the film are set in place and discussed, and they find their execution in the conversation between Caleb and Ava. For the most part of the film, that is the direction we feel Garland is moving toward, as the official tagline itself says, ‘there is nothing more human than the will to survive.’ But as we peer closer into the characters’ psyches we begin to confront the uncomfortable reality that nothing can be trusted at first glance. Perceptions are tricked and geared toward manipulation, and the audience in the shoes of Caleb find themselves leaning a little closer each time. The film finds a strange way of letting the viewer into the mind of Nathan, Caleb and Ava without it seeming close to heart, so that we can never be sure whose side to be on. This intelligently paced tension that trickles through every ‘session’ is the flesh of the movie, and boy is it intricately crafted. Once you start peeling away at the skin of Ex Machina, there is much to be noticed in terms of commentary on masculine/feminine archetypes in society. It is in this regard that Garland’s film falls strikingly close to last year’s Under the Skin, both running away with the idea of female perception in a male-dominated society. Nathan is the ultimate nerd genius, and yet every breath which he carries himself is set to destroy that stereotype: from the constant working out to the unfitting use of frathouse slang, Nathan is all set to take command over his species. There is something to be said about the fact that all of his android prototypes have been female in form, and the discomforting sexual component that is necessary to all of them, that also is the most primal of all emotion. These cringing horrors only multiply as more secrets start to reveal themselves, but never losing out on the ultimate goal of the film: a brutally true mirror of what it means to be human. As the film reared closer and closer to its end, the game is at high stakes and almost becomes a clever heist with each character believing that they are one step ahead of the other. And through all this intellectual drama, I found myself hoping to no end that the end be justifiable to the mastery of the film upto the point, having one in mind already. Without giving away anything of actual plot, I will say that the climax as it unfolded was the most satisfied I have been in some time. There is a certain awareness that a good film can inflict on you, so that you can see the end working itself out in your head in the only way you know it can and should end. Such an end as is this one cannot be classified as either unexpected or predictable; it lies somewhere in the middle: inevitable once you realize it. It is the end that can make or break a film, since that is the destination toward which the plot was leading us to. This assumes all the more importance in science fiction, where it is a culmination of every idea that we see appear: Interstellar suffered greatly due to its end and here a much lesser known film has succeeded. 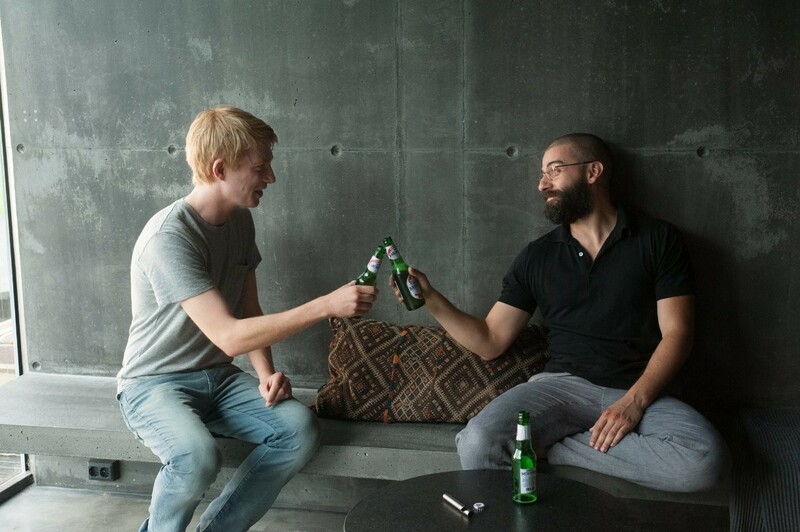 The ending to the intriguing tale of Ex Machina does justice to everything so far, and is the only one that makes sense; Caleb doing exactly what his character would, and Nathan’s genius unfettered in the realisation. It is this level of consistency and loyalty to the idea that makes masterpieces. Alex Garland’s directorial debut is most promising and has entered the hallowed halls of science fiction classics merely for its incredible execution of ideas. Driven by the most charismatic performances that blend perfectly with the mood of this uncomfortable film, each character presents a microcosm of humanity held at bare. The visual imagery is also elegant in its use of minimalism, with striking colours juxtaposed with the seemingly washed out Nathan; it has a visual sensibility very similar to Spike Jonze’s Her. Despite the division of the story into various ‘sessions’ there is never a loss of flow or tone in Ex Machina, as the film takes its time with the viewers to let its ideas sink in. There are very few films that can make its audience feel as smart as itself without stooping to a lower standard, and this is all owed to the incredibly poignancy prevalent throughout this feature. Taking no wrong turn and never letting the pressure out of the boiler, the film maintains its eerie yet breathtaking control to the very end. It is an exercise in the purest intrigue that the genre provides, making it an amazing work of cerebral sci-fi. This entry was posted in Fantasy, Movie Reviews, Sci-Fi, Screen Favorites, Thriller and tagged 2015. Bookmark the permalink. Pingback: David Harbour of Stranger Things = Hellboy!